2015 will be an interesting year for home lighting trends. We will see a shift where lighting will not only be more functional, but also more fun! New advances in technology will also play a pivitol role in the new lighting options seen in the upcoming year. A really interesting trend for 2015 is adding lighting to drawers and cabinets. This trend is not only functional, but can be done beautifully. Gone are the days when you have to sift through dark drawers to find that utensil since these lights automatically turn on when you open that door or drawer. It can additionally be an elegant way to showcase your dishes, glasses, and stemware when company come for a visit. 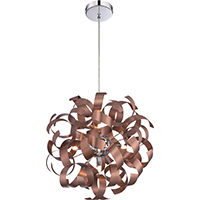 Warm metal lighting will be uber trendy in 2015. Copper lighting is a stunning way to add a new pop of color to your space. Using a variety of copper lighting from chandeliers to sconces to pendants is a great way to create a modern lighting scheme. Mixing other metals such as silver or gold with your copper pieces is an edgy way to vamp up your space. Falling lighting has been a growing trend. In 2015 homeowners will enjoy the fact that this trend has become an important part of enhancing your shower. More interior designers have using lighting in the shower to enhance relaxation and create ambiance. For custom designed showers, lighting is also a great way to draw the eye to those key design features. 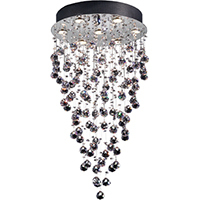 2015 will welcome the most eye catching, interesting chandelier designs. Our designers have seen trends that range from chandeliers that look like falling rain all the way to pieces of broken glass. These edgy lighting options are sure to grab attention and add a chic, modern twist to your home.